helveticka > news > 30 Years. 30 Collaborators. 30 Days. 30 Years. 30 Collaborators. 30 Days. How does a creative firm celebrate 30 years in business? Creatively, of course. 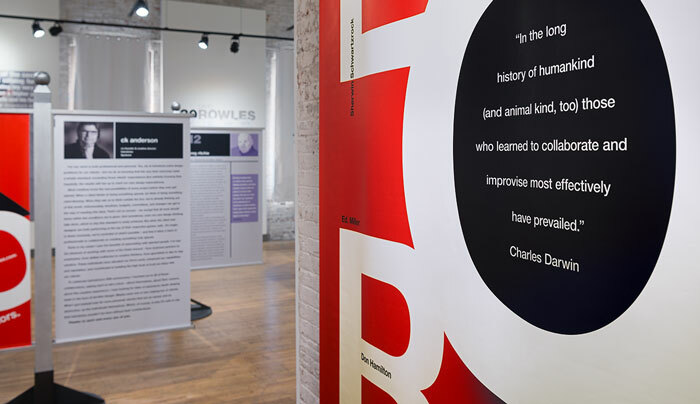 After three decades building relationships with talented specialists hired to help strengthen helveticka’s outcomes, the firm created an exhibit featuring unique perspectives from 30 of those people. Curated, designed, written, and installed by helveticka, CX30: Creative Experiences, Thirty Collaborators is unlike any exhibit the firm has ever done. While work from commercial visual artists is presented, the heart of the show is the stories provided by the participants themselves. Artists, photographers, illustrators, programmers, videographers, media buyers, printers, animators, fabricators, composers – even a cartoonist – provide insights; recall interesting, funny or challenging circumstances; reveal breakthrough moments in their careers; offer business philosophies; and, at times, share surprisingly personal details of their own creative experiences. “For those working in or around this industry,” says CK Anderson, principal and creative director at helveticka, “we think these stories will be compelling and relatable. For those thinking about a career in the arts, or new to the creative profession, we hope it will be inspiring and informative. And for everyone else, it’s a wonderful way to showcase some amazing local talent – the sort of creativity most people just don’t realize is out there.” CX30 can be seen at the Terrain Gallery, 304 W Pacific, throughout the month of August. Gallery hours are Thursday-Saturday, 5-7 p.m.